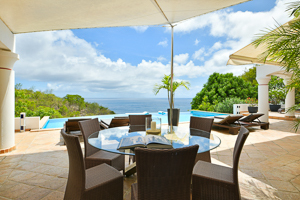 Villa UJV 223, also referred to as Jubilation, is a large 2-bedroom villa in a convenient and beautiful location in Lurin, St Barts, near Gustavia. It is extremely spacious, private and very open, and has wonderful ocean views over the south side of the island. The view stretches out over the horizon, and features sunsets during the early winter. UJV 223 is fully-equipped with numerous amenities. Large, equal-size bedrooms with 4-poster beds and spacious open-air ensuite bathrooms, make this the perfect villa for 2 couples. Villa UJV 223 is situated in an excellent location, only a minute or so drive from the main town of Gustavia, with restaurants, shops & boutiques as well as nearby Shell Beach.